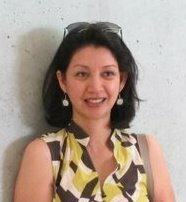 Daphne Neri Ceniza-Kuok, was one of the Board of Directors of The Center for Migrant Advocacy – Philippines (CMA-Phils.) She is an e-Lagda and ICOFVR member in Hongkong, was a member of the advocacy delegation of overseas Filipinos in 2001 that lobbied for the immediate passage of the absentee voting bill. She lived and worked in China for 8 years until 2001. She works as a Sunday school teacher in the Evangelical Community Church. MOST PEOPLE HERE KNOW her name. 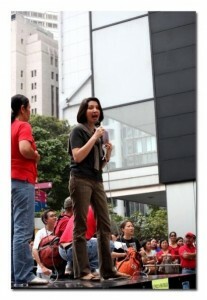 Daphne Ceniza-Kuok, after all, rings a bell. But few know that this Filipina’s life—a history of fighting for various causes from various angles —rings loud with something bigger than a married name associated with swanky hotels. Kuok, 47, carries a conviction from her past that remains unchanged. “Service, once it gets into you, will always be there,” Kuok tells the Inquirer in an interview at the Bayanihan Centre in Kennedy Town where the overseas absentee voting (OAV) was being held. Her story is an alphabet soup of political and non-government organizations since the 1980s. But for the last seven years, her advocacy has been spelled with only three letters: OAV. Kuok, a member of the International Coalition for Overseas Filipino Voting Rights (ICOFVR), has been devoted to encouraging overseas Filipino workers to exercise their political right to vote. 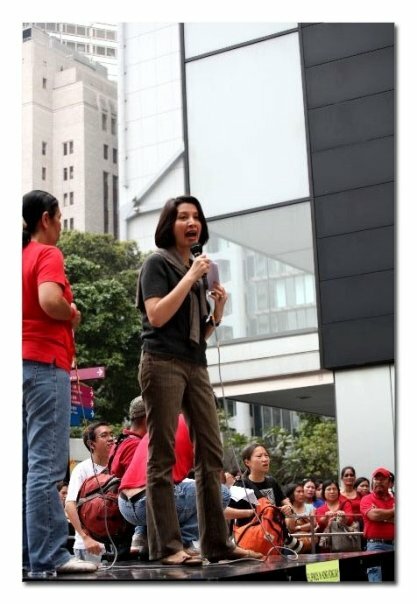 She sits as vice chair of the special board of canvassers in Hong Kong, the post with the second biggest population of registered overseas voters at 96,505. 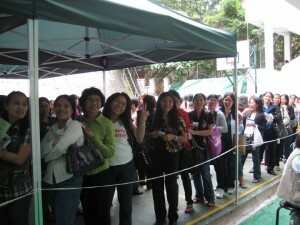 Hong Kong had the highest voter turnout in 2004, with 64 percent casting their ballots. The situation has been dismal this year, however. 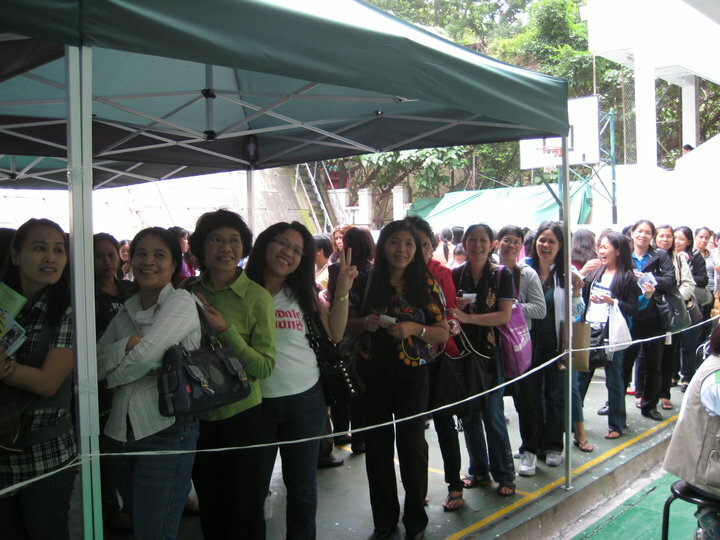 The Philippine Consulate and Filipino organizations here had exerted all efforts to encourage migrants to vote, even providing free bus rides to the polling precinct. Kuok says many OFWs were excited in 2004 because it was the first time they could vote outside the country. Others from the martial law generation who left the Philippines before democracy was restored were enthusiastic about simply voting again. The apathy in this second OAV showed that there is still “no appreciation of the value of voting” among OFWs, says Kuok. She says most OFWs do not realize that participating in the elections to determine who will make up Congress will directly affect their lives. “We have to remind them that they are here because of force of circumstance, of the economic situation back home. If it had been better, there will be no need for them to break away from their families,” Kuok says.“Now they have the chance to have their say, they should take care of it. We got the OAV Law because we pounded on Congress, we developed allies,” she says. In 2001, those behind the E-lagda, an online campaign among Filipinos abroad to support the ouster of then President Joseph Estrada decided to take on a new advocacy: overseas voting. Filipino professionals from all over Europe, the United States, China, Japan, Saudi Arabia, including Kuok who was then in Beijing with her family, formed the ICOFVR, a coalition that survived through e-mail but had enough clout back home to keep key allies in Congress. Although most of them have never met, the trust was such that one member from the United States even asked his sister in Manila to hand over a check for P175,000 to Ellen Sana, a member of the Center for Migrants Advocacy (CMA), for the payment of an OAV advertisement in the Inquirer. “So you see the dedication… That’s what I’ve been telling the consulate here, you have to get the community involved. There must be a sense of ownership of this activity,” Kuok says. After two years of lobbying, the ICOFVR finally saw Congress pass the OAV Law in 2003. The first OAV was held in time for the presidential elections in 2004. “Until now, we have not seen each other, but we still update each other about what’s going on,” Kuok says of the ICOFVR. The woman is no stranger to lobbying — fighting, to be precise. A Social Science graduate, she was a student leader in the University of the Philippines during martial law. She dropped out of UP law school in her third year after the wife of rebel priest Conrado Balweg was arrested by the military coming from her house. The military was hot on her heels then. Kuok was involved with the League of Filipino Students (LFS), and later, the Justice for Aquino, Justice for All (Jaja) movement, then the Nationalist Alliance for Justice, Freedom and Democracy (NAJFD) with the likes of Chino Roces and Lorenzo Tañada. She was also with the Women for Ouster of Marcos and Boycott (Womb), which did a “state-of-the-nation” fashion show. By the time democracy returned in 1987, ideological differences had split the communist movement in the Philippines, and Kuok, who described herself then as “a lone ranger” decided to try and get a job, like all her friends who had by then become lawyers. Unfortunately for her, a resumé with a rough sketch of her work experience as “media liaison officer during the ceasefire” did not impress employers. “I had been an activist for years, so I had nothing to show them… Imagine the humiliation of knowing you’re intelligent, or being in your Sunday best, and not even getting a chance to be interviewed,” she recalls. That period had been a life-changing journey for Kuok, who then put up her own boutique and supplies trading business instead. “At the end of the day, God will strip you of all your confidence until there’s nothing but you and Him,” she says. Kuok was with the Concerned Citizens against Pollution (Cocap) when she married in 1989. She moved to Beijing in 1994 and became a full-time wife and mother. When her family transferred to Hong Kong in 2001, Kuok picked up migrants concerns again. She founded the Filipino Community Services and Information Network (Filcomsin) and became an active member of the CMA in Manila. Involvement with the OAV is her way of rallying migrants to address the moral vacuum in the Philippine government, she says. “Everything that had happened in my life is part of God’s molding and equipping for me… Service is just something you have to do, I think,” she says.